Arc Angel?? Wait a minute... Wasn't that an one-album AOR-band from the beginning of 80's? The great multi-instrumentalist Jeff Cannata was one of the original members on the excellent self-titled album from 1983. Now are they back! After working in several other projects and with a few albums in his own name Cannata, Frontiers Records has succeed in getting Jeff to activate the old AOR/Hard Rock band again. 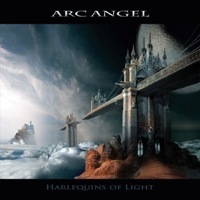 And what a magic hard rock album they have made with 'Harlequins of Light'. I don't know how long they have been working on this Arc Angel comeback release, but the tracks are absolutely gorgeous. The blend of the melodic rock and progressive rock creates a special and unique atmosphere in the sound picture, a mesmerizing package of melodic rock music. I get vibes of Asia, Toto, Yes and Marillion. Jeff's vocals are very smooth and clean. The songs are well structured and perfectly balanced so I took this golden album to my heart immediately. I can't sort the tracks out in better or weaker songs, because it depends on, which mood I am in. Charming songs with brilliant instrumental performances generate one of my highest scores ever...! In all honesty, I can't find any weak track on the disc so there will be twelve favorites. I really hope that Frontiers Records can sign-up Jeff and his musical craftsmanship, because this is at world-class level. I want more of this! This is one of the easiest recommended hard rock albums this year. This is certainly one of my favourite albums in 2013!